Medfield is Intel's mobile chipset, which will inherit the company's first foray into the mobile silicon world - Moorestown. It has the word mobile in its description, but shouldn't be confused with the dual-core Oak Trail, as found in the Samsung Sliding PC 7 Series, which runs Windows 7 for 6-9 hours before the battery dies down. 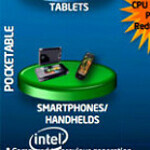 Medfield will be for tablets, smartphones and the like, which will most probably run Android and/or MeeGo. Threatened by the absolute dominance of ARM-based designs for current mobile chipsets, Intel decided to speed up Medfield's development, and is now promising phones and other devices with it as soon as the third quarter of this year. Medfield is built with the 32nm production technology, which might make it the most advanced mobile chipset in that regard in Q3. Will it be enough to sway people from ARM, and convince tablet, smartphone and MID manufacturers to consider it along with ARM-based chipsets, remains to be seen. Intel claims it will be more power efficient than chips with the ARM design - if it means the current generation, which is produced with 45nm, it might as well be. 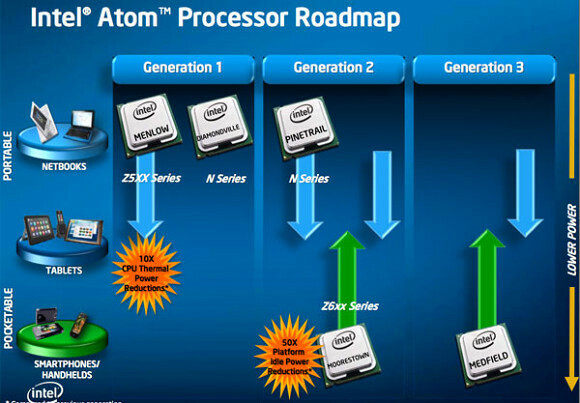 The quad-core ARM designs from Qualcomm, Texas Instruments and the rest, will rely on 28nm though, so we'll see. 28nm wafers are still few and far between, so Intel might enjoy some quality time with Medfield until the next-gen ARM Cortex-A15 devices hit the market late this year or the beginning of next. Intel acquired Infineon not long ago, so what we might see with Medfield is the first true mobile system-on-a-chip from Intel, wireless connectivity and all. We haven't seen any concept devices yet, although Aava Mobile flaunted one with Intel's 32nm chipset a while ago (pictured below). Intel was maybe a giant in desktop CPU technology and market. but a little left behind in the mobile chipset race. same way as Microsoft in mobile OS race that been lead by Google's Android. love to see this. +1. Intel has a lot of ground to make up. The handset manufacturers have already made significant investment in their respective chipset selections. If Intel thinks the handset manufacturers are going to dump their current chipset selections in favor of Intel products absent a compelling reason, they are deluding themselves.